The skirt is for sale here in http://facebook.com/ginantsilyo, for 1,200Php for small to medium size. But you can create your own for only Php50! 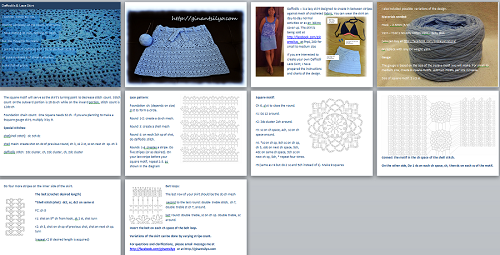 This entry was posted in Patterns and tagged crochet pattern for sale, crochet skirt on March 8, 2013 by Lorelie Dazo. Though the air is still chilly specially in the morning, most of us look forward to summer vacation. Ginantsilyo offers a stylish mix to match the summer heat! So, what’s on the shelf? The crocheted skirt is up as a “made to order” item. Small – medium size costs 1,200Php. Add Php200 per size increase. The skirt is made of cotton blend on soft blue tone. The hipline is accentuated with a square motif with adjustable “drawstring” belt. 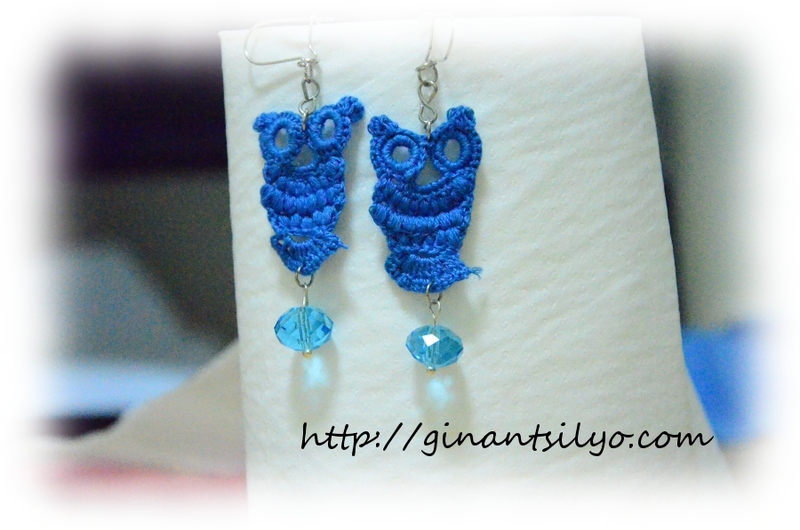 This entry was posted in Blog, Crochet, For Sale, Gawang Gantsilyo and tagged crochet earrings, crochet owl, crochet skirt, for sale, summer on January 28, 2013 by Lorelie Dazo. The two projects are a blouse and a skirt. 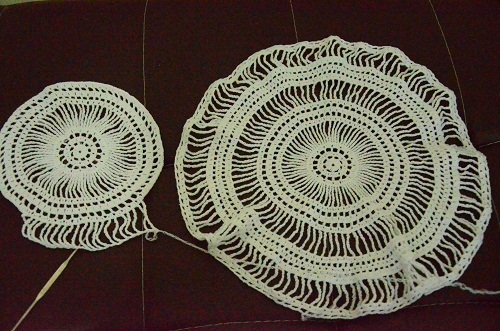 This is my courageous attempt to remake my white crocheted cover up, which I swore I won’t do again, ever, because of the tedious stitches used for the lace. But the design is really lovely and eye candy, so I mustered the courage to post it on my facebook page as an incoming for sale, and lo and behold, I received an order for this blouse. 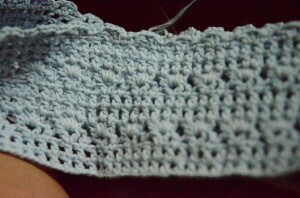 The blouse retails at P2,000 crocheted using a 1.60mm hook and cotton yarn. I must say I like this rendition better than what I was able to make for myself, because the yarn I used is softer and thinner. 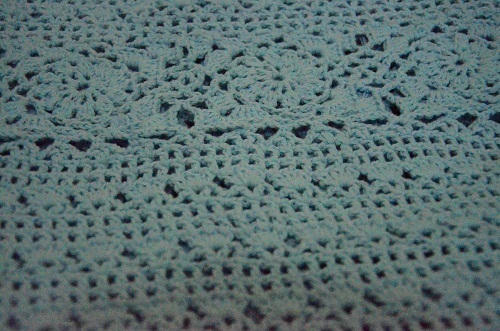 The lace came out the way I wanted it, full and clean. And here is the skirt, which is my mom’s first project but I have taken over to add the rectangular motifs around the waist. 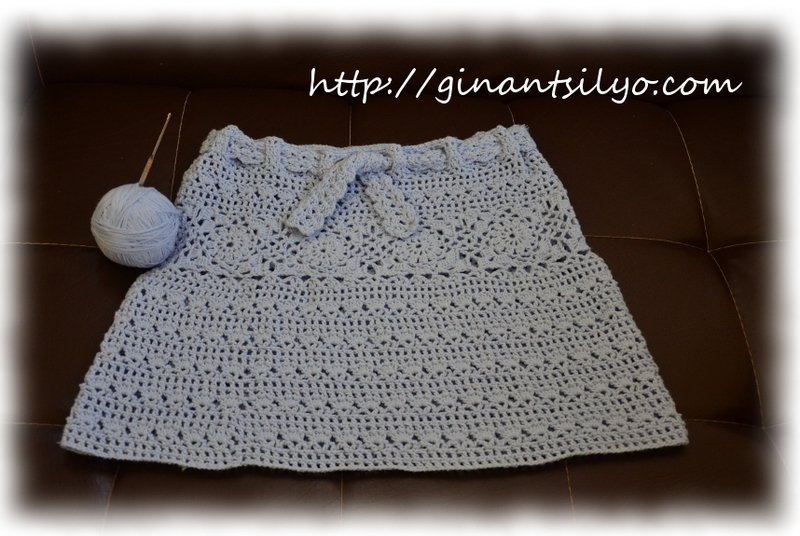 The skirt retails at P1,200 crocheted using 2.10mm hook and cotton blend yarn. I modified the original design because I cannot rest on just seeing the same pattern for the whole skirt. Our initial plan is to create a monochrome effect by changing to a different lighter colored yarn but it did not work out, so I have to plan for a better effect. I have tried several motifs and finally found the right one. It’s kinda nice, that I can spend my weekend at home with my family and while watching some tv, I am crafting while dreaming for the stuffs we will put in our new house with a prospect of getting some money out of my crocheted projects. 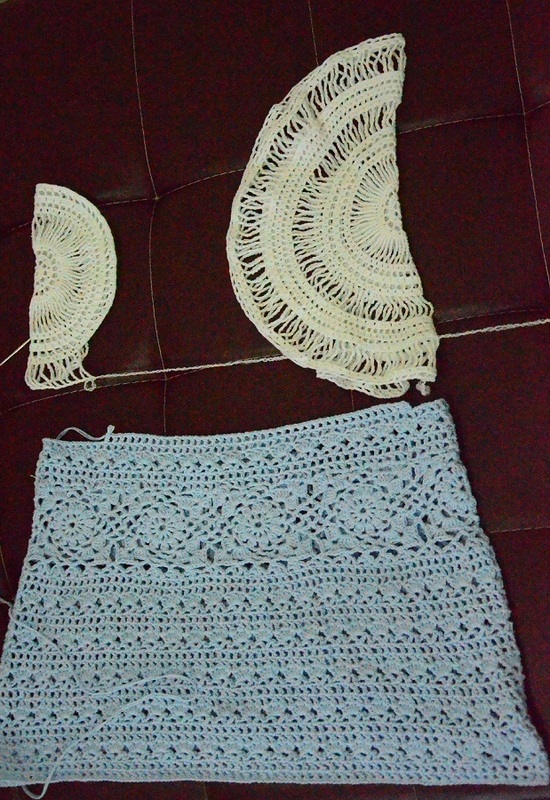 This entry was posted in Blog, For Sale, My Story, My Life and tagged blue, crochet blouse, crochet skirt, for sale, lace, motif, white on January 20, 2013 by Lorelie Dazo. I have influenced my mom to crochet again. And she has crocheted a lot ever since. Now she is helping me with my business. She is also taking orders from my facebook page as well. I am more than amazed on her finished skirt. She has been indulging me since last Christmas that she’ll make something for me. And here it is. 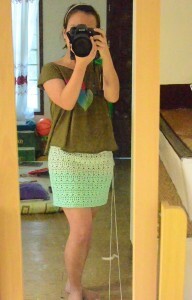 I really really like how the crocheted skirt turned out. As soon as I published the skirt on facebook, we had an order for this design. 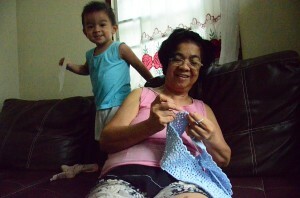 And my mom started it right away, she can crochet so long as my little kiddo won’t play around the yarn. This entry was posted in Blog, For Sale, My Story, My Life and tagged crochet skirt, for sale, mom on January 16, 2013 by Lorelie Dazo.